Understand the sponge method used for bread making and how and when this method is used for mixing yeast dough. There are three main mixing methods used for making yeast bread dough: The Straight Dough Method, The Modified Straight Dough Method, and The Sponge Method. The ingredients are mixed together in two steps with the sponge mixing method. The first step is to create the sponge, also known as a preferment. What is a Sponge (aka a Preferment)? A preferment is when some of the ingredients of the yeast dough are mixed together before the whole dough is made. This mixture is allowed to ferment for a period of time before the rest of the ingredients are added. This process creates more depth of flavor and also produces bread with a lighter and fluffier texture. The liquid, all or part of the yeast, and about half of the total quantity of flour are mixed together. 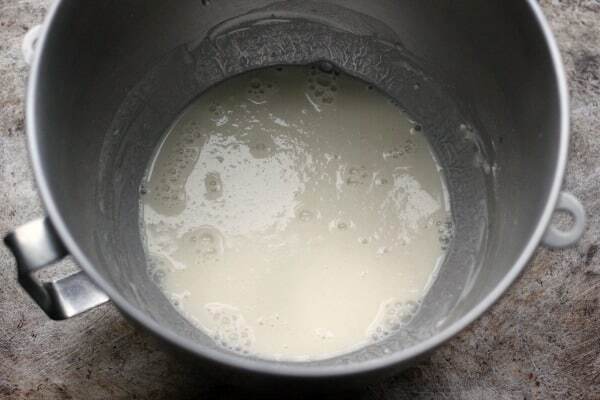 This makes a thick batter that will be left to ferment until it is double in bulk. After the sponge has doubled in size, deflate the air out of it and add the rest of the ingredients. Proceed with the recipe for making the bread. The sponge mixing method produces breads that have much more complex flavors and a lighter texture. This method is particularly desirable for whole grain breads. The sponge method does, however, create a longer process for the bread from start to finish. It should be noted that the sponge mixing method can be used for any bread recipes even if it doesn’t specifically call for this method. So sorry about that Kathleen! I have updated the link and it should be working now! yesss-I’ve made quite a few breads with the sponge method but didn’t know it was called that! So cool! I live in the Amazon area of Ecuador in a city of about 25,000. I moved from the U.S. where I made my own bread for many years. Bakeries here make only rolls and the loaf bread that is available in our two grocery stores is not great. So, of course, that has made me scour the Internet for recipes. New methods are evolving all the time. It’s good to keep up. I packed ‘my world’ of possessions in only suitcases, which over time, took a while to get here (through kindness of friends who brought some down for me) so my kitchen stuff is here, minus the one thing I miss: my Kichen Aid stand mixer. Shipping things later means paying a big tax so that’s a no-go. Many recipes can be made by hand, of course, but I used it for many things besides bread. I found you by following a pin on Pinterest. How glad I did. First, I want to thank you, for your in-depth information, and the careful step by step instructions and pictures you provide. I hope people new to bread-making will be inspired to see that making bread feeds more than the appetite. Most of all thank you for your generosity in sharing all you offer so willingly. I appreciate every word. Your upbeat personality makes it all fun to read. Elaine, what a sweet, encouraging message to read from you. Thank you so much! It’s an inspiration to hear of your baking endeavors overseas. I’m so happy you found the site! If you’re on Facebook, be sure to join my Facebook group! Why can’t I just get the ingredients why must I always sign up first. Hi Jeannie, you do not have to sign up! This post you are looking at is describing a mixing method that is used for many different recipes. This article is not a recipe. There are several links at the end of the post to recipes that use this mixing method. Which bread recipe in particular are you looking for? Hi Abet! I’m so glad you found this tutorial helpful! Your bread looks beautiful!